(ii) Reduced age-related problems such as joint, balance and stability issues. (iv) Overall slimming down and toned physique. And good news is that for a dumbbell workout plan you don’t need to go to gym, it just takes a set of dumbbells to get started. 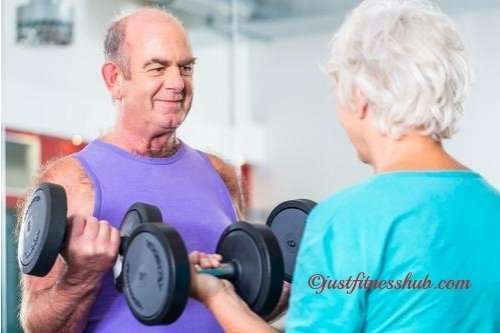 Note: For seniors before starting a strength workout, it is always a good idea to checkup with your doctor for clearance. This is particularly true if you haven’t exercised before or have taken a long break from physical activity. A dumbbell program for elderly is convenient (and inexpensive too) to do at home. In most cases, one wouldn’t require more than 3 different weights for a full-body workout. A typical workout program involves a series of exercises called as “repetitions” and “sets.” A repetition is one completion of an exercise, and a set is one group of repetitions. A more common training would incorporate 3 sets of 12-15 repetitions. In between sets, you should rest for 1 to 2 minutes, or more according to your physical conditions. For every exercise, select a dumbbell that is heavy enough to do 12 to 15 repetitions (reps) comfortably but not too comfortably – meaning that for doing the last 1 or 2 reps you should need to struggle a bit and your muscles should begin to feel tired. On the other hand, you should never select a weight that is too heavy. You can know it’s too heavy if you have to arch your back, jerk or swing your body to lift the weight. Not only will the targeted muscles be doing less work, you can end up injuring your back or causing damage to your joints. Note: Always remember to perform an exercise with complete control, never hurrying or allowing your body stray from of its neutral alignment. If you feel any discomfort, then stop and reduce the weights. Never go beyond your physical capability. (i) When starting workout first time, do it 2-3 times a week. Gradually work your way towards working on one body part once a week. This way you can develop all body parts, which will be more beneficial and provide you best results. (ii) A little soreness is expected. When first starting, you might feel a little soreness in the muscles and maybe even slight pain in your joints. This is normal. Most of the pains should subside in a day or two and you will feel less and less pain with each succeeding session. (iii) The “one body part a day dumbbell plan” automatically ensures ample rest for your muscles. (iv) If in the beginning you feel 3 sets of 12-15 reps are too much, consider doing 2 sets of 10-12 reps instead. Do not over train. (v) You should also do cardio exercises to maintain your cardiovascular health. I try to do cardio 5-6 times a week to keep my heart healthy. Are you above 50? What exercises you do? Please share your experience with us under the comments section.